This past weekend we threw my sister Sam a surprise birthday party, and oh boy was she surprised. She had absolutely no idea that there were 30-40 of her closest friends waiting behind the door to her apartment. Two of her friends did most of the work, setting up her apartment, bringing food and drink, decorating adorable mason jars with twine to serve a specialty cocktail, and adorning her entire apartment with beautiful flower arrangements that we asked each guest to bring. My sister’s place didn’t really need much prepping since it was in a pretty perfect state before she left. Sam has an unbelievable eye for home decorating, her apartment really looks like it should be in a segment on “Farmhouse Chic” in Home & Garden. She has this amazing ability to match old with new, to cover walls with art and to make a huge apartment feel warm and inviting. Since her friends were on apartment and guest duty, I had the somewhat simple job of being the decoy. This was made a little more complicated simply because I am a terrible lier. The decoy was for my mom and dad to come into the city and take her to brunch. I’m pretty sure I made at least 2 slip ups and acted a little weird the whole time knowing what was about to go down, but somehow I was able to pull it off, and my sister opened the door to her apartment overwhelmed with surprise. Since my role didn’t involve a ton of advance work, I wanted to make Sam a birthday cake. And since she is my sister, I wanted to make a very extravagant birthday cake. I recently bought a cake recipe book called “Sky High”, which as you can guess, is all about triple layer, sky-high cakes. 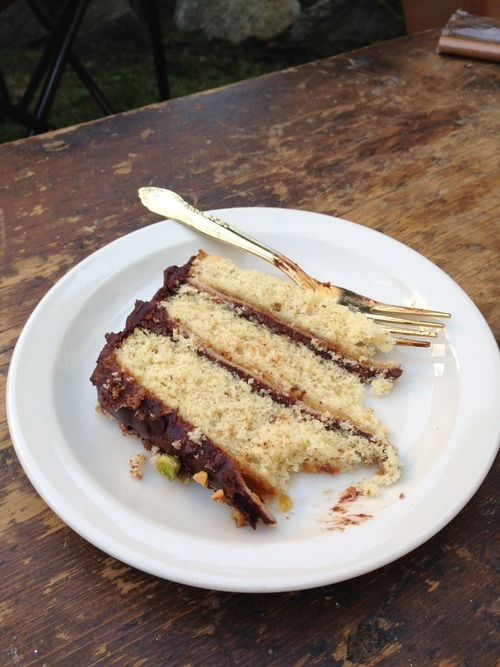 I had been pining over this pistachio layer cake, with marzipan, apricot and chocolate ganache, because come-on, what could be better than that? I thought of no better occasion than to make this for my sister’s birthday party. And I’m certainly glad I did. It was relatively straight forward to make, did take some time to assemble, but was well worth it. The guests raved over the cake and it was just as beautiful as it was delicious. Note: Icing a three layer cake is made much simpler if you freeze the cake layers before assembly. Once cake layers are cooled from the oven, triple wrap each layer in wax paper, place in freezer bags, and allow the cakes to freeze over night, or up to a month. When you’re ready to assemble the cake, take each layer out of the freezer as it goes on, so that layers are still frozen when you go to ice the whole cake. Once everything is stacked, make sure you apply a thin crumb coat to lock in any crumbs from the cake. Place back in the fridge for 20 minutes to seal in the cake, and then apply the rest of the icing. This makes a huge difference. 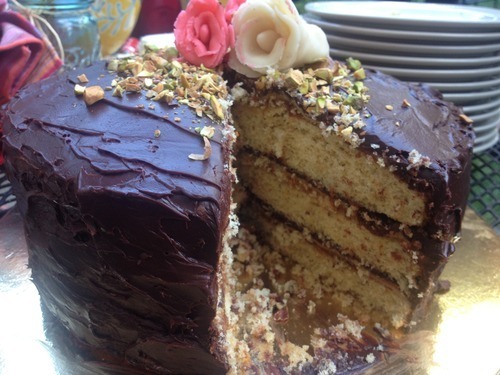 The Smitten Kitchen has a great post about other useful cake baking/decorating tips here. For the Marzipan: You can either find this in your local grocery store or make your own. 1. Preheat the oven to 350 degrees F. Butter and flour three 9-inch round cake pans, and line bottom with parchment paper. 2. Place the pistachios on a baking pan and toast in the oven for 7 to 10 minutes, until lightly browned and fragrant. Transfer to a dish and let cool completely. 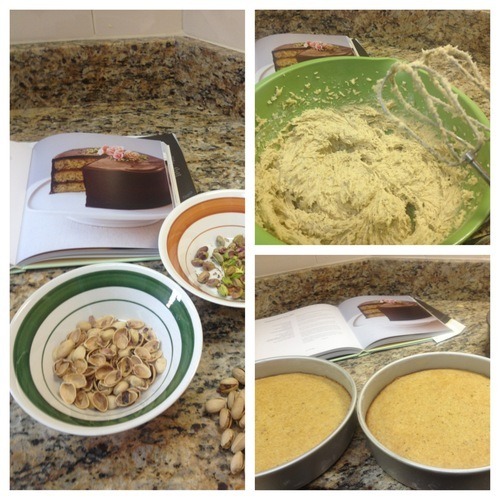 Finely chop pistachios and set aside 1/4 cup for decoration. 3. Put the remaining 3/4 cup pistachios in a food processor with the sugar and pulse until they are finely ground. Pour into a large mixing bowl and whisk in flour, baking powder and salt so that everything is fully incorporated. 4. Add the butter, milk and vanilla, and beat on low with a hand mixer until completely incorporated. Raise the speed to medium and beat until light and fluffy, 2-3 minutes. Add the beaten eggs in 2 to 3 additions and beat only long enough until everything is blended together. Divide the batter among the 3 prepared cake pans. 5. Bake for 20-25 minutes, until a toothpick inserted comes out clean. Allow the layers to cool for 10 minutes, and then turn out onto wire wracks. Carefully peel off the parchment paper and let cool completely. 6. Roll out a third of the Marzipan to 1/8 of an inch in thickness, on a work surface dusted with powdered sugar. Make sure to continue to lift up and add more powdered sugar to your counter as it may stick. Place the bottom of your cake pan on the Marzipan, and using a small knife, make a 9 inch round. Repeat two more times with the remaining Marzipan. 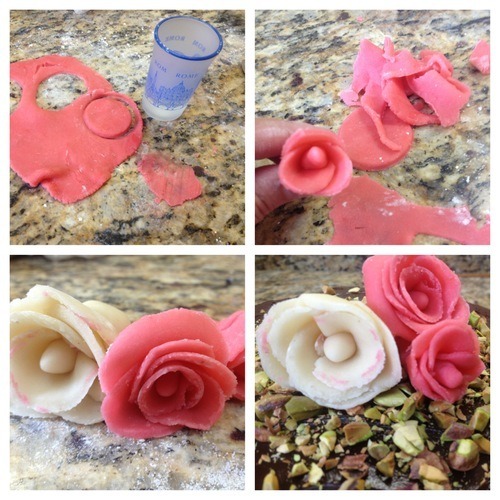 Save your scraps for Marzipan roses. 7. To assemble the cake, place one cake layer down on a cake board. Spread 1/4 of the apricot preserves over the cake layer, leaving a 1/4 inch margin all around. Layer one of the Marzipan rounds on top of the apricot preserves. Spread 1/3 cup of the dark chocolate ganache on top of the Marzipan so that it completely covers the surface. Repeat with the second layer, adding more preserves, then the Marzipan, then the Ganache. 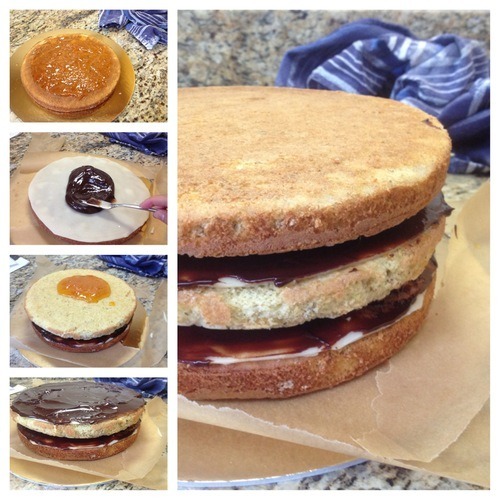 Top the cake with the third layer, spread with the remaining apricot preserves, top with the last Marzipan layer. 8. 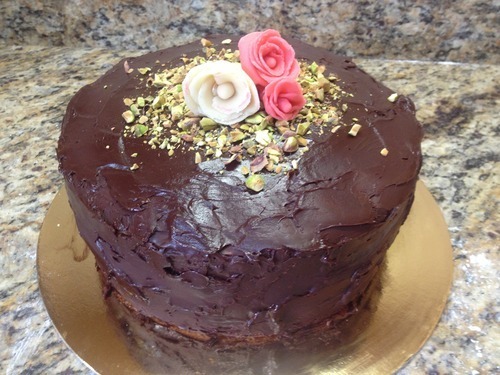 Add 1/2 cup of the ganache to the top of the cake, and spread over the sides to keep a thin layer all over the cake. 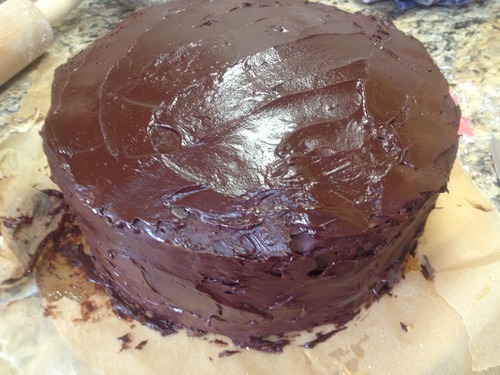 Add additional ganache if needed, but only put on a very thin layer, or your crumb coat. Place in the fridge for 20 minutes, until ganache has set, and then add the remaining ganache, in portions so that it completely covers the top and sides of the cake. Smooth to a glossy finish. Top with the remaining 1/4 chopped pistachios and Marzipan roses. Chop the chocolate coarsely and put in a heatproof bowl. Bring the cream to a bare simmer and pour the cream over the chocolate. Let stand for 5 minutes and then whisk together, until the glaze is smooth and shiny. Use glaze immediately so it does not set. Add the almond paste and confectioner sugar to a food processor and mix until combined. Add the corn syrup and pulse until smooth. Wrap well in plastic so that it doesn’t dry out and allow to rest at 2 hours before rolling out. To make the roses, first tint the marzipan with food die (I used red to make a pink hue). Flatten the marzipan into a disk, and roll out to 1/8 inch thickness. Cut Marzipan with a 1 inch cookie cutter (or I used a shot glass that I had on hand) to make 8 or 9 circles. Cover the Marzipan when you’re not using it so it doesn’t dry out. Roll one piece of Marzipan into a small ball, the size of a marble, and flatten so it’s in the shape of a cone, about 1 inch high. Take a round of Marzipan and wrap it like a petal around the cone, pinching it at the bottom to adhere and at the top to thin and ruffle slightly. Repeat with the remaining rounds, overlapping slightly as you work around, until petals form the shape of a rose. It’s that easy!